A fragment of a wall relief showing the upper part of an image of the goddess Maat wearing a tripartite wig, a wide usekh collar, bracelets, and a tunic supported by shoulder-straps. Her head is surmounted by her emblem, a feather, the symbol of truth and justice. rules the land of silence (the necropolis). 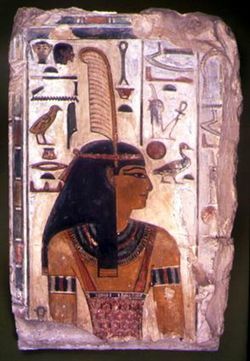 AA.VV., Nefertari. Luce d'Egitto, Roma, 1995, pg. 228, n. 86.